Springfield High School sophomore Deborah Persico, 16, marches during the March for Our Lives march and rally in Philadelphia on March 24, 2018. ELIZABETH ROBERTSON / Staff Photographer . It’s been one year since droves took to streets across the nation to protest gun violence following the slaying of 17 students and staffers at Marjory Stoneman Douglas High School in Parkland, Fla.
On the anniversary of the student-led March for Our Lives demonstration Sunday, student activists in Philly are holding “A Rally to Remember” in LOVE Park as a reminder that there’s still work to be done. Philly isn’t alone — while it’s not clear exactly how many, a number of similar events are happening nationwide, but this time without one larger march anchoring them, like last year’s demonstration in Washington. The Philly event, slated for noon to 3 p.m., will feature speeches and performances from students, activists, and artists, as well as a memorial where rally-goers can pay tribute to loved ones lost to gun violence, said Alex Franzino, a 17-year-old junior at Hopewell Valley Central High School in Pennington, N.J., and the director of operations for March for Our Lives Philadelphia. “We really try to focus on, I mean, obviously carrying the message from Parkland, but also connecting it back to urban gun violence," Franzino said. March for Our Lives Philadelphia at an event. An organizer at last year’s march told The Inquirer she wasn’t sure if there would be a sophomore event. A permit on file for Sunday lists an expected attendance of about 125 people, said Lauren Cox, a spokesperson with the Mayor’s Office. A police presence will be on site, she said. A number of smaller events similar to the Philadelphia rally are happening Sunday in communities around the nation — the March for Our Lives Fort Thomas chapter in Kentucky has a march slated, while March for Our Lives Manhattan is hosting an “afternoon of performances.” There’s an “Activism for Our Lives” in L.A. and a “Looking Back and Moving Forward” event in Austin, Texas. Events in places like Sarasota, Fla., and Indianapolis happened earlier this month. There isn’t an anniversary march listed on the national organization’s website, but something a little different is planned. Protesters hold up signs in front of the U.S. Capitol during the March for Our Lives rally along Pennsylvania Avenue in Washington DC. Saturday, March 24, 2018. On Tuesday, the group plans for a pop-up gun-violence-prevention art installation outside the U.S. Capitol, according to an email outlining the organization’s plans, while March for Our Lives D.C. will host a Lobby Day Monday, where members will deliver letters demanding lawmakers pass gun-violence reforms. Franzino said she may have been a little surprised when there didn’t appear to be an anniversary march planned by the national organization, but she suspected a shift in focus. Last year, we marched. Last November, we voted. Now, we fight. The mission of MFOL is not another march, but to create a force of change across the nation and the world. Visit our website to find a chapter near you! Together we will continue to mobilize, organize, and win. The national organization did not respond to a request for comment. He said raising awareness is hard work. “I and others who are engaged in this work, we just keep putting our heads down, we keep going, and there aren’t really anniversaries for us, because every day is a new day with sadness in it," he said. » READ MORE: Her grandfather survived a mass shooting. Then she did, too. Now she’s a House intern during gun background check vote. 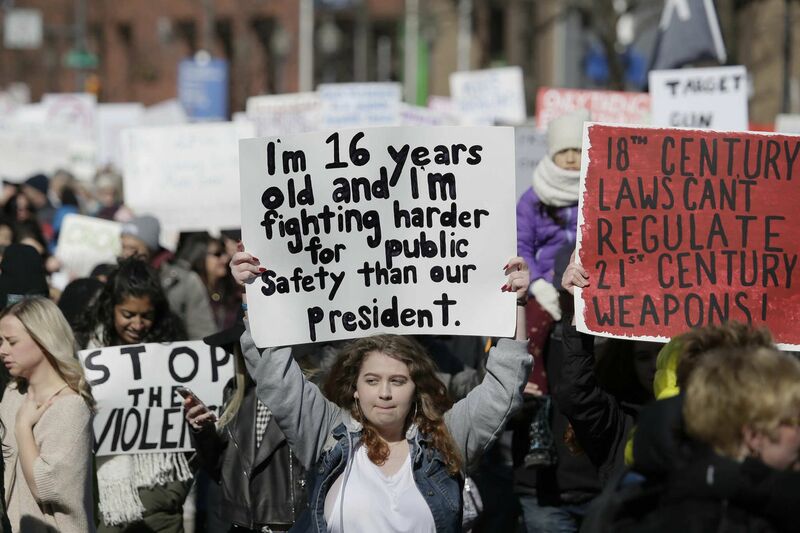 » READ MORE: The world is listening to Parkland teens. Some Philly kids wonder: Why not us?